Have you ever woken up and discovered two cats in your living room? Well, that’s how my Thursday began. I’ve never really been an animal person, not because I don’t love animals, but because I’ve had…bad experiences. It started out with Flopsy-Mopsy-Cottontail, my adorable little bunny. Apparently if you keep offering a bunny food, it will continue to eat, even after it has become completely satiated. Alas, six-year-old me thought I would help out by feeding the bunny…and I fed it to death. After that, we tried again with a hamster, but alas, he escaped his cage and burrowed into the floor in our basement, never to be seen again. After these two incidents, my family realized animals kind of hate us, and now, we just have fish in a pond outside. We throw them some food and they swim around and look pretty. It’s the perfect noncommittal pet-owner relationship for my family. 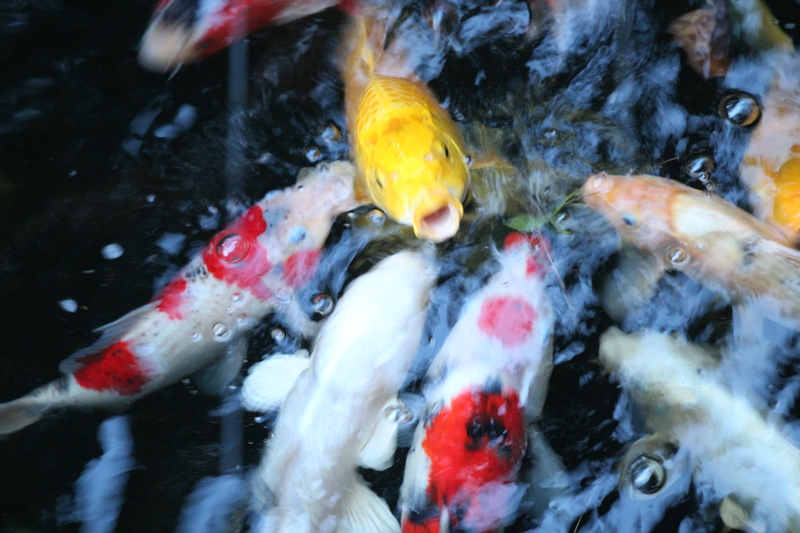 Our monstrously huge koi, battling for dinner. So clearly, I do love animals, but these two cats, perhaps sensing that my love tends to kill, have done a fairly good job of avoiding my advances. I’m doing my best to redeem myself, but just today, I found myself falling back on old habits, a.k.a. trying to win them over with food. (Let’s be real, I apply that strategy to all animals that I encounter, humans included.) The kitten, still innocent and trusting, accepted the food happily. However, Blow, the momma cat, saw that accepting the food would only lead to trouble, and staunchly ignored my outstretched hand. Despite this inauspicious beginning, I’m determined to get pet ownership right this time around for Flopsy-Mopsy-Cottontail, may he rest in peace. For now, I content myself with stroking the cats as they run away from me. 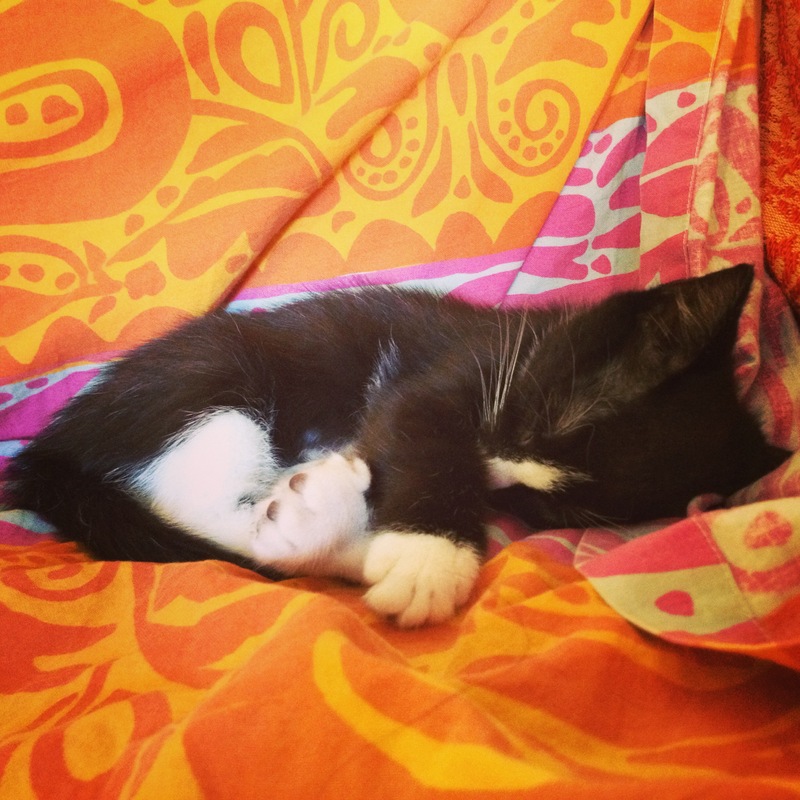 Mo, the newest addition to our household. 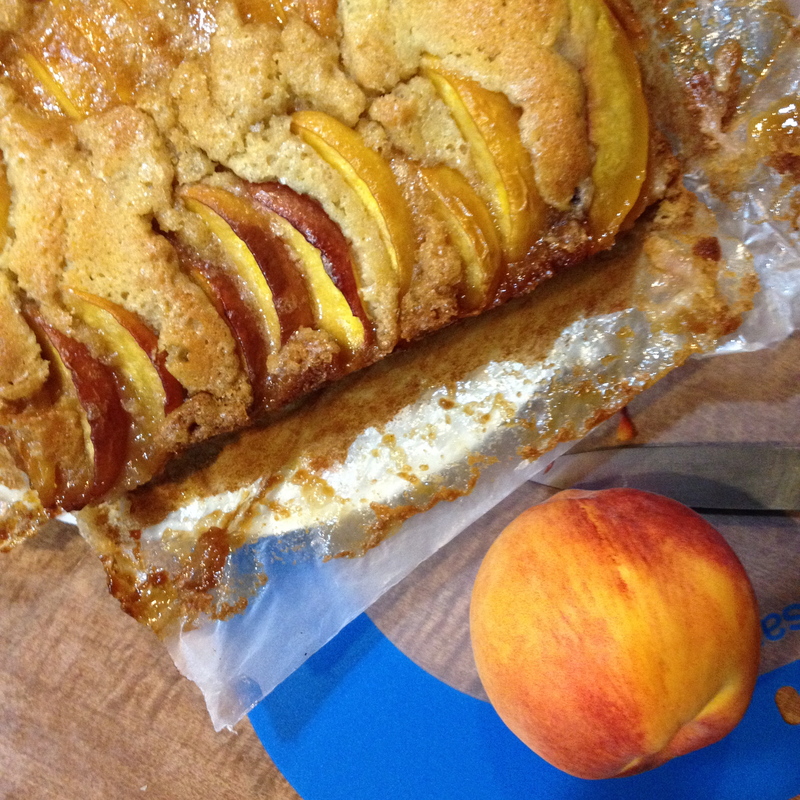 And on that note, here’s a fantastic and easy recipe for toffee-dimpled peach cake. If you’re looking to buy love with sweets, this is the recipe you’ve been looking for. The sweet peaches, the slightly spiced cake base, the crunch of the toffee – it’s just the perfect combination of flavors and textures. I made it not even 24 hours ago and it has already been completely consumed, with rave reviews. Just…try not to overfeed anyone.That cause of death would just be embarrassingly tragic for all involved. In the bowl of a stand mixer (or a bowl with an electric hand mixer) beat butter and sugar until light and fluffy, about 3 minutes. Beat in egg, then vanilla. In a separate bowl, whisk together flour, baking soda, salt, cinnamon, and nutmeg. With the mixer speed on low, add 1/3 of the flour mixture, followed by 1/2 of the buttermilk, then repeat, ending with the flour mixture. Spread into an 8×8 greased baking pan. Layer the sliced peaches on top of the cake in rows, overlapping the slices slightly. In a small bowl, combine brown sugar and butter and salt until it resembles wet sand. Drop half-teaspoonfuls onto the cake. Bake for 45 minutes to an hour, until the center is set and springs back when lightly touched. Serve warm or at room temperature. I will definitely be making this when I have time to do so. Peaches are one of my favorite fruits. I also like how you told about your cats. This peach thing looks almost as beautiful as Mo.